Bengaluru FC is organising an exhibition game between erstwhile football powerhouses, Hindustan Aeronautics Limited SC (HAL) and Indian Telephone Industries FC (ITI) at the Bangalore Football Stadium, on Saturday, January 19 at 4 pm. Notable players who will be taking part in the showpiece event include RC Prakash, Balaji Narasimhan, M Babu, Sunil (ADE), Muralidharan and Ilyas Pasha for ITI, while HAL will have the likes of Xavier Vijayakumar, Sunil, Satish Kumar and Gangadharan in their ranks. Proceeds from the sale of tickets to the game, which will be available on matchday at the Bangalore Football Stadium, will go to the HAL and ITI teams, and will be priced between Rs. 30 and Rs. 100. HAL: Basheer, Jeevanandan, Willian Crasta, Satish Kumar, Sunil, U Babu, Rajendra, Raju Sr., Paul, Somu, Gangadaran, Lawrence Sr., Lawrence Jr., Xavier Vijayakumar, Arvind, Yoganathan, Jacob, Vinod. RD Babu (Coach), Ravindranathan (Manager). ITI: Sundareshan, Mohan Kumar, Shakaf, Subramaniam, Aslam Khan, P. Kumar, Thomas, Rahmathulla, Rajashekar, Emanuel, Fairoz, John Kenneth Raj, Karun Raj, Vigalmani, Raja, Nazeer Ahmed, Ambrose, RC Prakash, Lionel, Vishnu, Muthukrishna, Ashwath Murthy, Rozario Estebiero, Ronnie Estebiero, Padmanabhan, Sendhil, Avijit Chaterjee, Francis, Verghese, Venkatesh R., Manohar, Harry Frank, Kumar, Harry Philips, Dinakaran, Antic, Tamilmuthu, Charles. Sri. 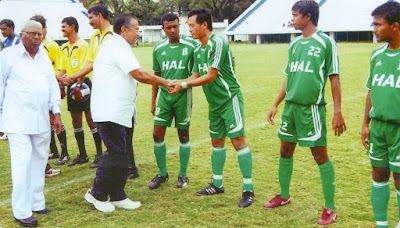 Kantharaj (Coach), M Babu (Manager).